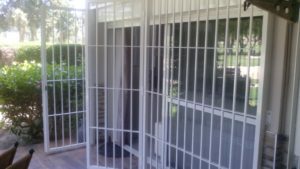 With more than 30 years of experience in steel and stainless steel fabrication, we offer anything from securing your home or business with steel gates, window grills and driveway gates to safety railings and balconies. We also manufacture stainless steel and glass pool surrounds, staircases and a wide range of other products. Fulfilling all your needs, we design, manufacture, paint and install to your requirements to a very high standard. 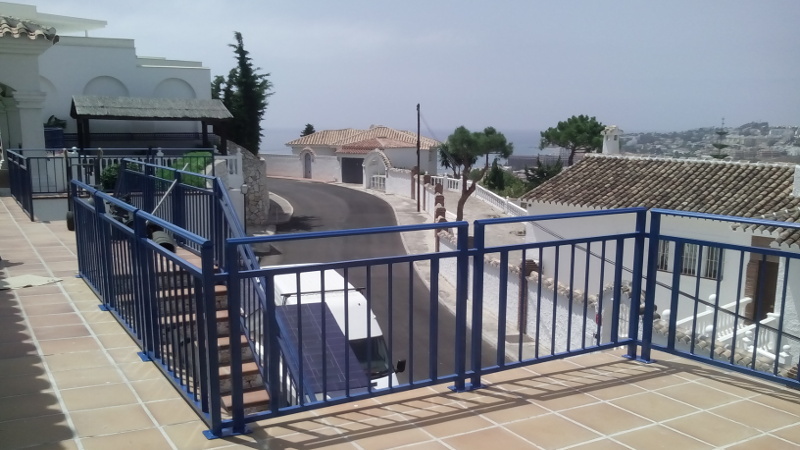 Situated on Mijas Costa, next to Fuengirola, Las Lagunas, Costa del Sol, Spain we cover the whole coast from Nerja to Gibraltar and also inland. We make all kinds of staircases, spiral staircases, indoor staircases, railings, banisters, handrail, fencing, balustrades, balconies, outdoor galvanized staircases with sheet metal treads etc. All fully fabricated to the dimensions of your building. All our ornate steelwork is undercoated and top coated with any color paint you would like. 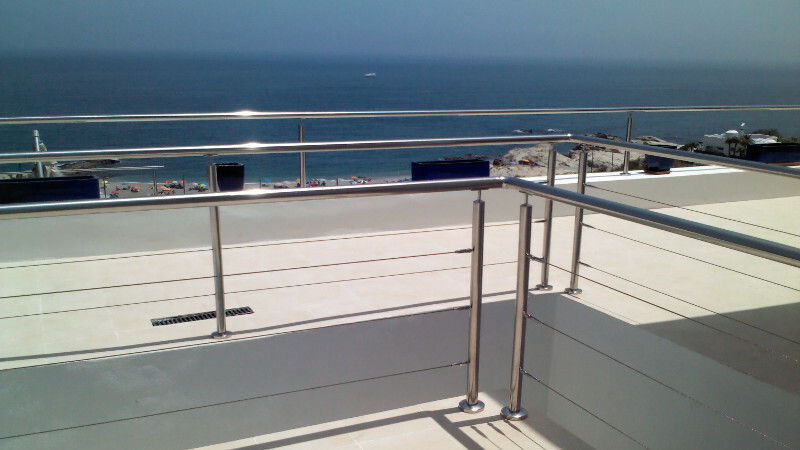 We manufacture our own custom made railings and balustrades to any measurements you require. We also have a large range of styles, spears, decorative insert panels and other accessories to give your railing that professional touch. We recommend you follow the building regulations on hand rail for the stairs, staircases and railings. We are capable of designing and manufacturing stairs and handrails to building regulations. If you are have work carried out which is subject to planning permission or you own a property which is rented out, then this could affect you. There are certain building regulations which may apply, a fall or drop of more than 600mm (2 feet) must be guarded by a rail which is no less than 1100 mm high, you must not be able to pass a sphere of 100mm in diameter through any gap, this means upright bars must be no more than 99mm apart. For a hand rail going up or down stairs the 100mm sphere rule applies but they must be 900mm high. We can offer a wide range of high quality stainless steel products for your home, boat, pool or kitchens etc. As stainless steel is corrosion resistant their life expectancy is usually very long, although more expensive initially. They offer a minimum of maintenance and maximum durability, especially here on the coast. We fabricate all the products in our workshop or on site, to the highest of standards with a polished, grained or matte finish. The Main entrance gate is the door to your home or community which offer protection, privacy and beauty. 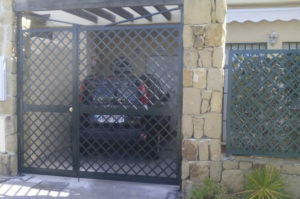 We can design and install customized gates for your security needs. We also supply remote controlled gate automation, key pad entry systems for sliding or centre opening gates, steel framed wooden gates, wood look sheeted gates, sheeted gates and much more. Our wrought iron steel gates and window grills are made to order for you or your community’s specific requirements. 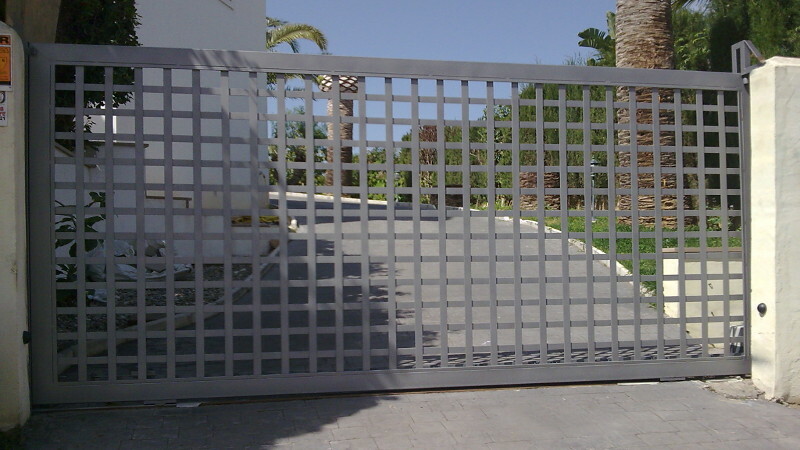 We manufacturer a wide range of steel gates and window grills, including garden gates, front door single gates, archway gates, patio door , double, triple and quadruple gates, electric automated entrance gates, sheet metal gates and more. Window grills can also be made in all sizes and designs. We also make opening grills with a lock for emergency exit in case of fire. 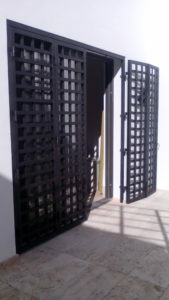 All the gates and window grills are hand made out of mild steel or stainless steel. There is a variety of colors and finishes available from matt, satin, gloss or hammerite. We undercoat and topcoat all our products to give a quality look as well as protection against the elements. We also supply made to measure scissor gates which are ideal for almost anywhere you would need securing. They fold away , out of the way very compact and are low maintenance. Scissor gates are galvanized, powder coated and come in a wide range of colors. 1 Free Quotations: Just contact us to make an appointment. We'll come to you to discuss your requirements. After working the quote out it will be sent to you. 2 Free security checks: Just contact us to make an appointment and we'll come around and survey your property and inform you as to the security measures you may need to make your property secure. 3 In house manufacturer and installation: all our products are manufactured in house and installed by the same people , not a third party, which means we can keep the quality to the highest standard from the manufacturer to the installation. 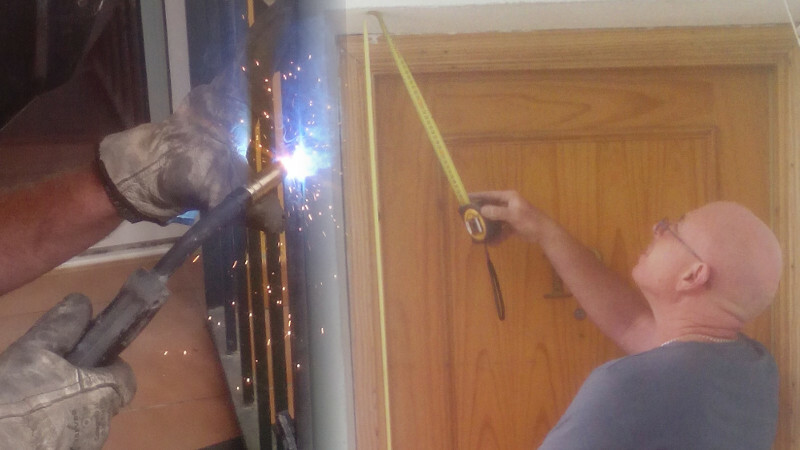 4 On site welding and repair work: We also provide on site welding for structural work and repair work. 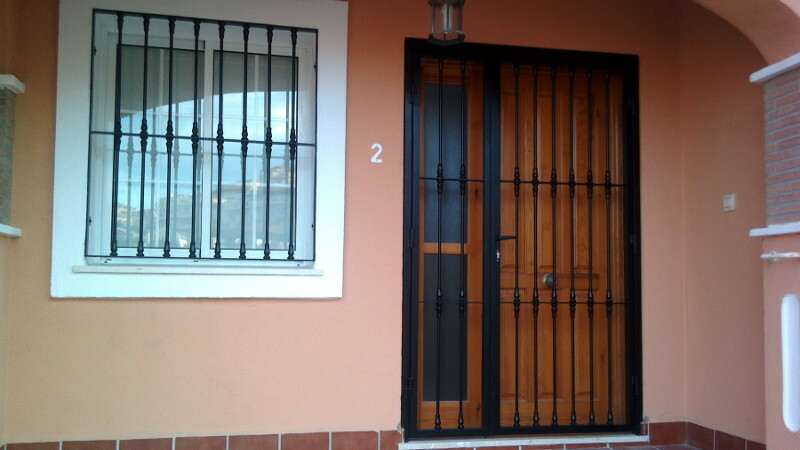 I had a break in at my apartment in Spain, it’s a ground floor apartment and we had no security on the patio doors. 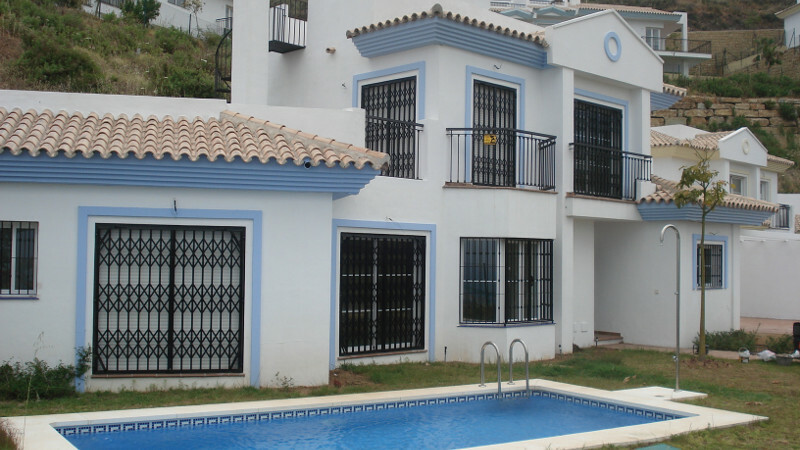 I placed an ad on one of the face book flog it sites for Fuengirola and Adam from Secure-it was recommended to us. Adam turned up promptly as arranged to measure and provide a quote. He was very competitive and we agreed on the price. I paid a deposit on the confirmation of the work and arranged a time for installation. Adam came to install on the date we had arranged. They look lovely and fitted well. Adam even repaired my broken persiana at the same time which had been broken in a burglary. I was really pleased with the finished product and Adam was a very clean worker leaving no mess behind. I would highly recommend him and Secure-it in the future! 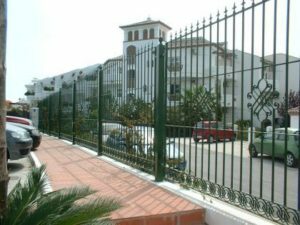 Just a short note to thank you for the great job you done of manufacturing and fitting the new gates to front of our house in la Cala. Being in the building game myself I have very little confidence in finding anyone that can do what they say, when they say, but gladly I was pleasantly surprised with your company who did exactly what you said you would do with a great result to finish. I would have no hesitation in recommending your firm to other clients. We would like to thank everyone at Secure-it for the excellent quality of our new patio door bi-fold security gates. They are much heavier duty gates than we expected and are very simple to use. The costs where very reasonable also. The fantastic customer service we received throughout the ordering and delivery process was very much appreciated. I would be very happy to recommend your company and products to anyone that asks us about our new garden gate and security gates . I am please to confirm that since we have adopted your Company recommendations to install Automatic Double Entry Gates, a remote controlled Pedestrian Gate and enclosed the Community with decorative railings we have reduced the actual and attempted break-ins from approximate 8 to 10 per year, since our inception 5 years ago, to virtually none. The reduction in attempted and actual break-ins. The peace of mind factor for each of our Owner's of having a virtual closed and secure Community. The property value has certainly increased due to the above factors. I am more than happy to recommend your Company to any potential Client as we have always found you professional and realistic in all of your approaches to our Community needs.